· Last Day of Registration—CLOSING SOON, REGISTER NOW--Some teams are full. · Rosters Finalized—TBD, Coaches will contact all players. $329 to be paid in full at time of registration. Registration closing soon, register now!! Due to the popularity of our program, any unpaid registrations will be deleted after 48 hours and you must re-register. Football age is based on player age on July 31, 2019; please refer to program divisions below. Tentatively set for July 24th 630pm to 8pm at Ardrey Kell High School Auditorium--This date is subject to change. Meeting will be at Ardrey Kell High School auditorium. Paperwork can be turned in at this meeting. No equipment will be handed our unless all paperwork is turned in and full program payment is made. An equipment deposit check in the amount of $100 will be required when all paperwork is submitted. The check will NOT be deposited unless equipment is not turned in at the end of the season. The new player draft process will be an opportunity for new players (and players that have elected not to return to their 2017 team) to run through various speed, strength and agility drills to be evaluated by our coaches. This will run from 6:30-8:30pm on TBD at Olde Providence ES (more details will be sent out as this date approaches). All players that attend this event are guaranteed to get placed on a team. Players that sign up before July 15, 2019 and have paid the registration fee will be assigned to teams first. Players that sign up after July 15, 2019 or choose not to return to their previous team will participate in a "new player draft" on July 20, 2019. Our goal in team formation is so that all our coaches feel teams are formed as evenly as possible with regards to new players to South Charlotte Recreation Association. 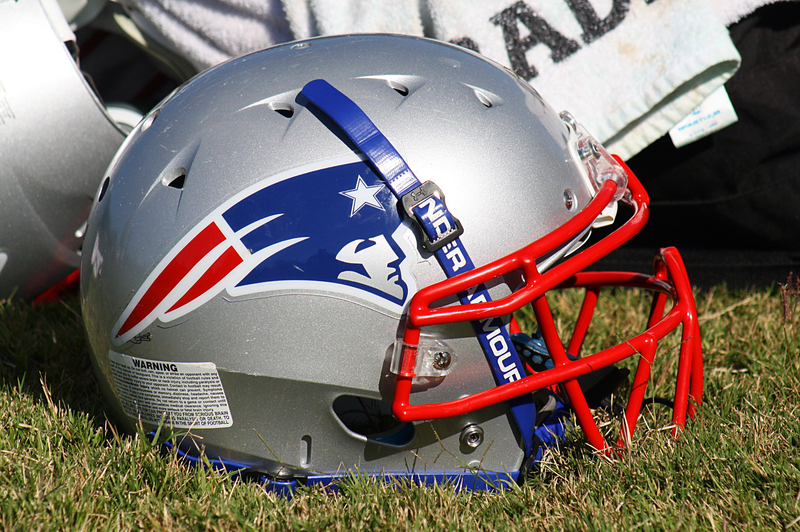 Players will not be officially placed on a roster until their registration fee is paid. Unpaid registrations are deleted after 3 days. The ability to form Junior Varsity teams is dependent on the number of registrations we receive, players at this level should register by July 15, 2019 so we can determine the ability to create teams. At this time we cannot guarantee anyone placement on a Junior Varsity team until we review the total number of registrations. If a Junior Varsity team cannot be formed, refunds will be issued in accordance with our Refund Policy. If you are a returning player, meaning you played for the South Charlotte Patriots in the 2018 season, and want to play on the same team as last year with the same coach/coaches, whether or not that team is moving up to the next division, you are guaranteed a spot on that team provided the following condition is met: You register and are paid in full by July 1, 2019. Any returning player registering after July 1, 2019, and wanting to play on the same team as last year with the same coach/coaches, whether or not that team is moving up to the next division, will not be guaranteed a spot on their previous year's team and will be placed on a team based on availability. This may be the same team you were on last year, but after July 1, 2018, that cannot be guaranteed. Additionally, returning players will be given team placement priority. 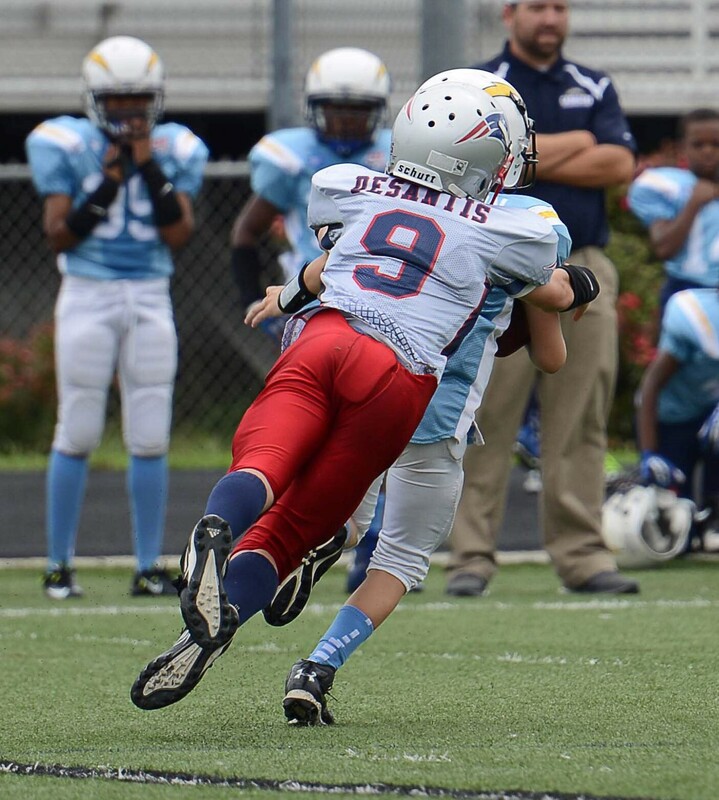 The Pop Warner Little Panthers League offers the opportunity for participants from five years of age to 13 years of age to play football in the league. 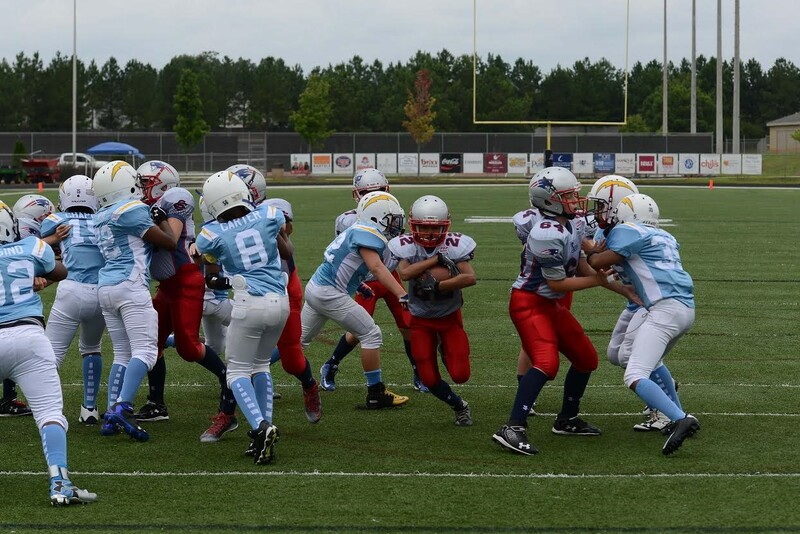 The Little Panthers League provides opportunities for participation in football in five age/weight divisions. Tiny Mite is an instructional division. Mitey Mite is a competitive division that is focused on training and learning the game. Please note the age/weight limits and comments for each program. AGE IS AS OF JULY 31, 2019. South Charlotte Recreation Association does not allow players to "play up" from the Mitey Mite division. All players that qualify for the Mitey Mite division will be required to play in that division. We do not recommend that any player play up if they qualify for a lower division. Ages 5, 6 and 7 weighing between 35 & 75 pounds. The intent is that 7-year olds would play Tiny Mite. Exceptions given if the player weights more than 75 pounds or the association does not field a Tiny Mite team. Tiny Mite, for the most part, is a child's first year participating in tackle football. Ages 7, 8 & 9 weighing between 50 & 100 lbs. Mitey Mite is strictly a training division and although the score is kept, the emphasis is on learning, completely free of any pressure to win. Age 11 weighing between 65 & 95 lbs. 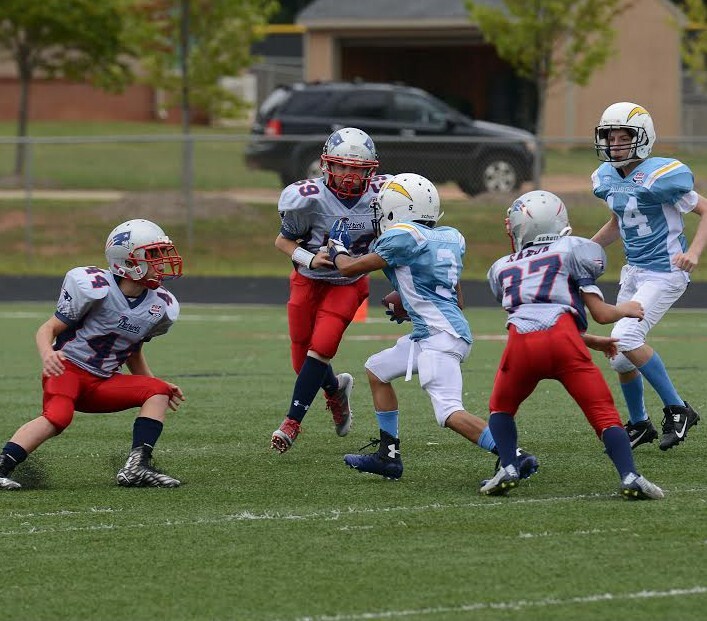 Jr. Pee Wee is the first division that is closest to full-blown tackle football. Coaches must stay on the sidelines. High school rules are followed with some exceptions. 11 year olds who would qualify as an older-but-lighter player in Pee Wee should strongly consider staying in Jr. Pee Wee. Age 12 weighing between 80 & 110 lbs. 12 year olds who would quality as and older-but-lighter player in Pee Wee should strongly consider staying in Pee Wee for the additional year. Age 13 weighing between 95 & 135 lbs. Jr. Varsity is our toughest division to field a team due to CMS middle schools holding football tryouts so late. Players planning to try out for middle school ball should sign up for Jr. Varsity during the open registration period. If the player makes the middle school team, they are welcome to return to the Patriots team at the conclusion of the middle school season in accordance with the policy below. NO REFUNDS are given for players leaving the program for a middle school team. If your child intends to try out for Middle School football, please click here for a detailed explanation of our Middle School player policy. 1. Participant Contract and Parental Consent- This Pop Warner document is the basic registration form and contract signed by participants and their parents agreeing to the rules of Pop Warner. Please click here for pdf form. Additionally, by signing up with South Charlotte Recreation Association, families agree to the Association's Code of Conduct, which can be found here. 2. Physical Fitness & Medical History Form- This Pop Warner form is a signed statement from an examining physician licensed in North Carolina that a candidate is physically fit and there are no observable conditions which would prohibit his or her participating in football. Please Note – The Physical Examination Form must be dated after January 1st, 2019. Please click here for the Pop Warner Form. A school physical form or doctor's form may be used in place of the Pop Warner physical form (Page 2), but it must be dated after January 1, 2019, and must be accompanied by PAGE 1 of the Pop Warner Form.